When I first discovered yoga, I found this soupy fragrant meal to be deeply nourishing, satisfying, and a little bit thrilling—that moment when your body/mind register an affirming “Yes – this is so good for me”. As an inexpensive vegetarian and simple-to-cook protein, this staple is loved by not only yogis but by many. 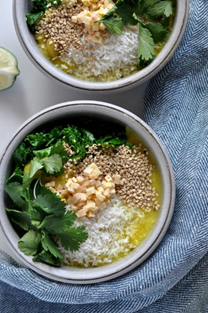 Dahl—which derives from the Sanskrit word dhal and means “to split”—appeals to yoga practitioners because it’s considered a nutritious part of a sattvic, or pure, diet. It’s an ideal food for those looking to create balance in their bodies and lives—like yogis. In India, a watery, spice-free moong dahlis usually a baby’s first food because it’s easy to digest and nutritious. Dahl is also considered tri-doshic in Ayurveda—the ancient Indian system of healing and sister science to yoga—which means it suits every dosha, or your unique physical and mental constitution that influences well-being.The low-cost, high-nutrient legume fits into the notion of balance and simplicity. In addition to signalling a dahl’s origin, the choice of legumes also dictates nutrition and preparation – the more intact or whole the pulse, the more nutrients and the longer the cooking time. And although the word dahlmeans “to split,” some dahllegumes are cooked whole. For example, the salmon-colored, split red lentil (masoor dahl) takes about 12 minutes to surrender into an ideal porridge-like consistency, but the same lentil in its whole, brown, uncooked, un-split state can take up to 45 minutes. An essential step in preparing dahlis cooking it long enough. Look for the ‘porridge like’ consistency.There are hundreds of international and household variations on dahl. Although people throughout India use the same five or so legumes or pulses—an umbrella term for lentils, beans, and peas—the hot oil-spice blend known as the tarka varies a lot (The tarka is made by cooking ghee or hot oil with whole spices or a spice blend—masala—in a small skillet). On its own, dahl could surely get boring but the variations are endless. And unlike those pure carbs, dahl offers a much more complex, nourishing nutritional profile—all of which can make dahla yogi’s dietary best friend. Dahl is a powerhouse of nutrition that nourishes the body while empowering the senses –yogi food for the senses – I like that. Kitchari is another amazing yogi food. Its super simple to make and so packed with goodness. It is basically a combination of dahland rice. It’s a meal that embodies a delicate simplicity of ‘less is more’ – which I appreciate. It’s made from rice and mung beans, lightly spiced with ginger, and other spices—is considered a fasting food and is used to purify digestion and cleanse systemic toxins. In a medium pot, heat the ghee or coconut oil, cumin seeds, mustard seeds, coriander over medium heat until the mustard seeds begin to pop. Immediately add the turmeric, and mung beans and cook, stirring frequently for about a minute. Add the water and bring to a boil. Reduce to a simmer, partially covered and cook for about 45 minutes or until the mung beans have broken down, losing their solid form. Add the root vegetables and salt and cook for 15-20 minutes more, until they are quite soft. Add the greens and cook about five minutes more. Turn off the heat and add the lemon juice. While the dahlis cooking, make the rice. Place the rice in a fine mesh strainer and rinse a couple of times. Heat the ghee or oil, over medium heat. Add the rice and cook, stirring frequently for a minute or two, until the rice is well toasted but not yet browning. Add the boiling water and boil the rice, uncovered for five minutes. Reduce heat, cover and let simmer until all of the water is absorbed, about 10 minutes. To serve put some rice into a bowl and ladle the dahlover top of it. Garnish with coriander, a squeeze of lemon juice, the coconut, sesame seeds and melted ghee, if using.